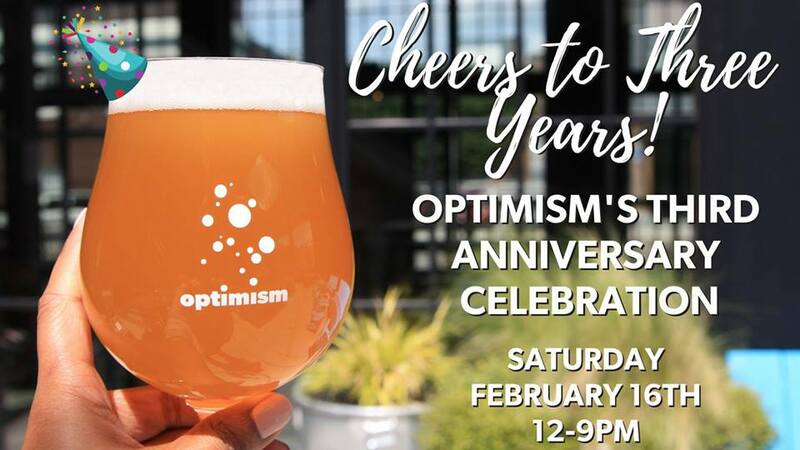 Optimism's Cheers to Three Years! We’re celebrating our third birthday and we want to celebrate it with you! We'll have free glass giveaways (while supplies last), which you can use to cheers our brand new TRIPLE HAZY IPA with. We'll also have raffles for amazing prizes (like free growler fills for a year or a day brewing with our brewers), free merch (like shirts with our OG brewdog Barley the bulldog on it), brewery tours (like sip on a beer while you learn about beer), and 18+ beers on tap to keep your glasses full (like B.E. Juicy and Solarpunk Sours). CheBogz Filipino Food Truck, Alaskan Dumplings, and Off the Rez will be serving up delicious delights that'll keep your beer company. Charity raffles will be supporting Capitol Hill Housing and we'll also be donating a portion of all our proceeds from our birthday party to CHH. Drink beer for a great cause! Good things come in threes, so bring three of your friends and/or dogs, and let's have a celebration*! It's free admission to our birthday party (duh!) - but really, bring your kids and dogs, cuz we're friendly to all.